Caries lesions are the most common cause of enamel and dentin breakdown, and are promoted as bacterial in origin. However, not all breakdowns primarily involve bacteria.1 One condition that is not a result of bacterial manifestation is what has commonly been termed noncarious cervical lesions, frequently referred to as abfractions.2 Characterized by a loss of hard dental tissue, these lesions (Figure 1) are most commonly found near the cementoenamel junction (CEJ). Notably, noncarious cervical lesions have defined internal and external angles. They most often occur on the facial surfaces of the teeth and are typically wedge- or V-shaped (Figure 2 and Figure 3).3 This article explores historic and current thoughts regarding noncarious cervical lesion etiologies, explains abfraction, presents modern bio-dental engineering terms, and offers treatment recommendations based on the existing evidence. Grippo2 coined the term abfraction in 1991. 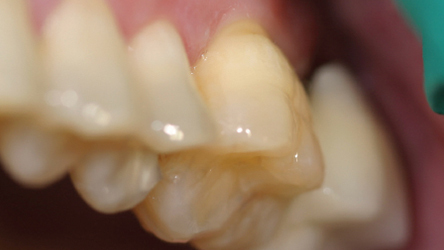 Clinical investigations confirming a positive association between excessive occlusal loading and abfractive lesions approach this topic differently. In 1977, Xhonga15 reported a relationship between the extent of occlusal wear, bruxism, and the presence of what later would be termed abfractions. Coleman et al16,17 found a high degree of association between cervical dentin hypersensitivity (CDH) and abfractions by location and distribution. Although the authors did not so state in their 2000 and 2003 publications, occlusal therapy resolved CDH for noncarious cervical lesions produced by stress, not necessarily the more recently specified designation of abfractions.16,17 Sawlani et al18 used more modern terminology in their investigation, and reported that heavy occlusal forces played a significant role in the development of noncarious cervical lesions. They also dismissed abrasion as a less-than-major factor in their development. Today, the term biocorrosion better defines the chemical, biochemical and electrochemical mechanism of noncarious cervical lesions; it replaces former terms corrosion, erosion and others relating to hard tissue degradation. Biocorrosion encompasses endogenous and exogenous acidic and proteolytic chemical degradation of enamel and dentin, as well as the piezoelectric electrochemical action on the collagen of dentin. Aaron12 proposed it is incorrect to designate only one mechanism to be the cause of these lesions. Figure 4 shows the schema of pathodynamic mechanisms of tooth surface loss introduced by Grippo et al19 as an amended version of its initial appearance in an earlier publication. 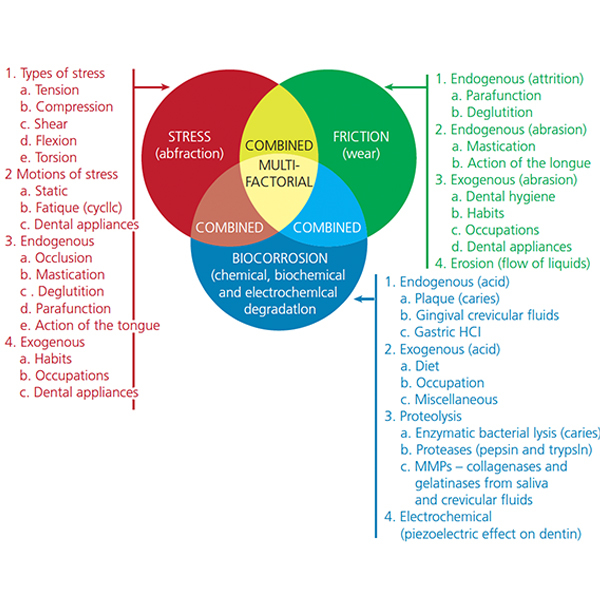 Figure 4 illustrates the complex cofactorial nature of bio-dental engineering mechanisms of stress, biocorrosion and friction, as they apply to dental hard tissue degradation. It is frequently difficult to identify any of these three mechanisms as the major etiologic cofactor in noncarious cervical lesion formation or progression. FIGURE 4. The Grippo and Oh schema illustrates the three bio-dental engineering mechanisms of stress, biocorrosion and friction, as they can contribute to cervical dentin hypersensitivity, noncarious cervical lesions, cervical caries and root caries. The cofactorial nature of these mechanisms is likely to play a role in the genesis and progression of these pathologies. REPUBLISHED WITH PERMISSION: GRIPPO JO, COLEMAN TA, MESSINA AM, OH DS. A LITERATURE REVIEW AND HYPOTHESIS FOR THE ETIOLOGIES OF CERVICAL AND ROOT CARIES. J ESTHET RESTOR DENT. 2018;30:187–192. 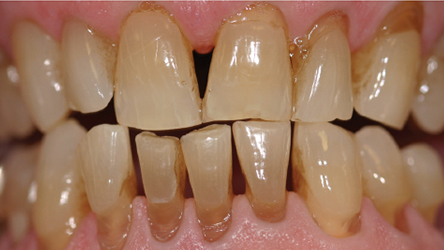 A 62-year-old male presented to the University of Arkansas, Fort Smith Dental Hygiene School for evaluation and routine oral hygiene treatment. He reported an esthetic concern for the upper right first premolar (Figure 5A). This buccal noncarious cervical lesion on tooth #5, as well as the wear pattern on the lingual surface of what appeared as an adjacent deciduous cuspid, prompted a thorough dental history, clinical evaluation and radiographic analysis. There was no evidence of prior restorative treatment for tooth #5. Although not shown in the Figure 5 series, a panorex film disclosed a high horizontal impaction of tooth #6. An abfraction was found on the contralateral buccal aspect of tooth #21 (Figure 5B). No other noncarious cervical lesions existed for this patient. Figure 5C shows partial maximal intercuspal position closure, whereas Figure 5D illustrates more complete interarch tooth contacts. Upon report by the patient, no evidence of bruxing was active. Clinical interpretation did not uncover evidence of either endogenous or exogenous excessive biocorrosion or pathology by friction related to toothbrush/dentifrice abrasion. The passive supereruption of tooth # 5 and lack of a rapid cuspid-rise for the right lateral excursion seemed likely responsible for development of noncarious cervical lesions for teeth #5 and #21. Summarily, this patient was referred to a general dentist for diagnosis and treatment. Familiarity with the Grippo and Oh Venn schema (Figure 4) is deemed useful for clinical interpretation of causative factors for noncarious cervical lesions. Abrasion from toothbrush use and cleaning habits must also be considered.20 Overzealous toothbrushing or improper brushing technique may very well be a contributing cofactor in hard tissue loss. Yet presumption that oral hygiene and dentifrice are strongly related to the etiological presence of noncarious cervical lesions is lacking adequate foundation.23 Toothbrushing in the presence of acid can contribute to a more rapid development of these lesions. The most noted etiologic factors are acidic biocorrosion and stress conditions. Preventive measures to reduce acid challenges on the teeth are essential to managing these patients.30 Occlusal parafunction is a possible involvement, as are oral habits.31 As more evidence comes to light, a multifactorial etiology becomes more and more complex. If all of the etiologic factors are not identified or considered when deciding how best to treat noncarious cervical lesions, continued progression will occur and the restorations will fail prematurely.36 Since there is no clinical evidence that restorative treatment alone is effective in impeding further development of lesions, restorations alone cannot be used as a preventive measure to stop their progression. 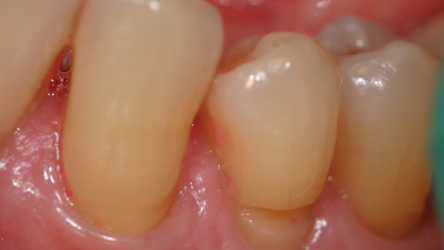 Both studies support an interdisciplinary approach whenever gingival recession is involved. A bottom-line approach was to attempt to achieve maximum esthetics, tooth form and function for vital pulp conditions. Challenges in restoring noncarious cervical lesions include difficulties in obtaining moisture control, gaining access to subgingival margins, and high failure rates. Rubber dam clamps, gingival retraction cord and periodontal surgery are methods that can be used to control gingival tissue moisture and facilitate access. Other reasons for restoration failure include lack of retention, secondary caries, and marginal defects at the time of initial placement. Potential negative consequences include discoloration and prolonged tooth sensitivity. There is also considerable evidence that amalgam and gold have little use in the modern-day restoration of noncarious cervical lesions. Clinical studies have shown that restoration of abfractive lesions has a high percentage of failure in the cervical margin region. Glass ionomer cement (GIC), resin-modified glass ionomer (RMGI), GIC/RMGI liner/base laminated with a resin composite, and resin composites in combination with a dentin bonding agent are all possible restorative options. A restorative material such as a self-adhering resin ionomer can be ideal for restoring lesions because of its high tissue compatibility. It must be noted that microfilled composites demonstrate greater elasticity than hybrid composites that can allow comparable flexure to dentin or enamel under applied stress from abfraction. In conclusion, inasmuch as the treatment of periodontal disease often requires a multifaceted approach, current evidence supports a multifactorial etiologic determination for these lesions. An understanding that abfractive effects to hard tissue from stress is only one factor in the development of lesions is crucial. The etiology of noncarious cervical lesions often remains misunderstood, and more research is needed to fully understand this fascinating and frequently encountered condition. Careful diagnosis is the key to understanding noncarious cervical lesions and it begins with a thorough medical history. Research indicates the cause is not occlusal factors alone, but, rather, multifactorial — especially involving biocorrosion in combination with cervical stress stemming from hyperfunctional or parafunctional occlusal forces. Biocorrosion includes the progressive loss of tooth structure through chemical processes that could also involve bacterial action. It replaces former terms corrosion, erosion and others relating to hard tissue degradation. Since there is no clinical evidence that restorative treatment alone is effective in impeding further development of lesions, restorations alone cannot be used as a preventive measure to stop their progression. As additional evidence comes to light, the multifactorial etiology of these lesions becomes more and more complex. Miller N, Penaud J, Ambrosini P, Bisson-Boutelliez C, Briançon S. Analysis of etiologic factors and periodontal conditions involved with 309 abfractions. J Clin Periodontol. 2003;30:828–832. Grippo JO. Abfractions: a new classification of hard tissue lesions of teeth. J Esthet Dent. 1991;3:14–19. Bartlett DW, Shah P. A critical review of non-carious cervical (wear) lesions and the role of abfraction, erosion, and abrasion. J Dent Res. 2006;85:306–312. Grippo JO, Simring M, Coleman TA. Abfraction, abrasion, biocorrosion, and the enigma of noncarious cervical lesions: a 20-year perspective. J Esthet Restor Dent. 2011;24:10–23. Yang J, Cai D, Wang F, et al. Non-carious cervical lesions (NCCLs) in a random sampling community population and the association of NCCLs with occlusive wear. J Oral Rehabil. 2016;43:960–966. Borcic J, Anic I, Urek MM, Ferreri S. The prevalence of non-carious cervical lesions in permanent dentition. J Oral Rehabil. 2004;31:117–123. Terry DA. Cervical dentin hypersensitivity: etiology, diagnosis, and management. Dent Today. 2011;30:61–62,64,68 passim;quiz 70. Miller WD. Experiments and observations on the wasting of tooth tissue variously designated as erosion, abrasion, chemical abrasion, denudation, etc. Dent Cosmos. 1907;49:1–23. Rees JS. The effect of variation in occlusal loading on the development of abfraction lesions: a finite element study. J Oral Rehabil. 2002;29:188–193. Sarode G, Sarode S. Abfraction: a review. J Oral Maxillofac Pathol. 2013;17:222–227. Grippo JO. Biocorrosion vs. erosion: the 21st century and a time to change. Compend Contin Educ Dent. 2012;33:e33–e37. Aaron GM. The Prevalence of Noncarious Cervical Lesions in Modern and Ancient American Skulls: Lack of Evidence for an Occlusal Etiology. Available at: http://ufdc.ufl.edu/UFE0004872/00001. Accessed October 11, 2018. Lee WC, Eakle WS. Possible role of tensile-stress in the etiology of cervical erosive lesions of teeth. J Prosthet Dent. 1984;52:374–380. 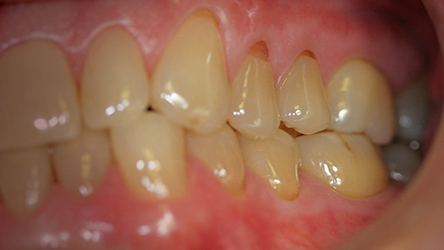 Lussi A, Jaeggi T. Dental Erosion: Diagnosis, Risk Assessment, Prevention, and Treatment. Hanover Park, Illinois: Quintessence Publishing; 2011. Xhonga FA. Bruxism and its effect on the teeth. J Oral Rehabil. 1977;4:65–76. Coleman TA, Grippo JO, Kinderknecht KE. Cervical dentin hypersensitivity, Part II: associations with abfractive lesions. Quintessence Int. 2000;31:466–473. Coleman TA, Grippo JO, Kinderknecht KE. Cervical dentin hypersensitivity. Part III: resolution following occlusal equilibration. Quintessence Int. 2003;34:427–434. Sawlani K, Lawson NC, Burgess JO, et al. Factors influencing the progression of noncarious cervical lesions: a 5-year prospective clinical evaluation. J Prosthet Dent. 2016;115:571–577. Grippo JO, Coleman TA, Messina AM, Oh DS. A literature review and hypothesis for the etiologies of cervical and root caries. J Esthet Restor Dent. 2018;30:187–192. Zero DT. Etiology of dental erosion — extrinsic factors. Eur J Oral Sci. 1996;104:162–177. Litonjua LA, Andreana S, Bush PJ, Tobias TS, Cohen RE. Noncarious cervical lesions and abfractions — A re-evaluation. J Am Dent Assoc. 2003;134:845–850. Tellefsen G, Liljeborg A, Johannsen A, Johannsen G. The role of the toothbrush in the abrasion process. Int J Dent Hyg. 2011;9:284–290. Faye B, Kane AW, Sarr M, Lo C, Ritter AV, Grippo JO. Noncarious cervical lesions among a non-toothbrushing population with Hansen’s disease (leprosy): initial findings. Quintessence Int. 2006;37:613–619. Brandini DA, de Sousa AL, Trevisan CL, et al. Noncarious cervical lesions and their association with toothbrushing practices: in vivo evaluation. Oper Dent. 2011;36:581–589. 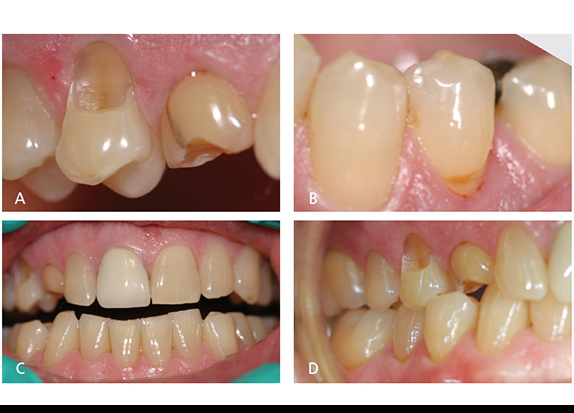 Nascimento MM, Dilbone D, Pereira P, Duarte WR, Geraldeli S, Delgado A. Abfraction lesions: etiology, diagnosis, and treatment options. Clin Cosmet Investig Dent. 2016;8:79–87. Ranjitkar S, Kaidonis JA, Smales RJ. Gastroesophageal reflux disease and tooth erosion. Int J Dent. 2012;2012:1–10. Grippo JO, Simring M, Schreiner S. Attrition, abrasion, corrosion and abfraction revisited. J Am Dent Assoc. 2004;135:1109–1118. Wood I, Jawad Z, Paisley C, Brunton P. Non-carious cervical tooth surface loss: a literature review. J Dent. 2008;36:759–766. Kaidonis JA, Richards LC, Townsend GC. Nature and frequency of dental wear facets in an Australian Aboriginal population. J Oral Rehabil. 1993;20:333–340. Michael JA, Townsend GC, Greenwood LF, Kaidonis JA. Abfraction: separating fact from fiction. Aust Dent J. 2009;54:2–8. Piotrowski BT, Gillette WB, Hancock EB. Examining the prevalence and characteristics of abfractionlike cervical lesions in a population of U.S. veterans. J Am Dent Assoc. 2001;132:1694–1701. Kerstein RB. Disocclusion time-reduction therapy with immediate complete anterior guidance development to treat chronic myofascial pain-dysfunction syndrome. Quintessence Int. 1992;23:735–747. Klein M. A comparison of ICAGD (immediate complete anterior guidance development) to mock ICAGD for symptom reductions in chronic myofascial pain dysfunction patients. Cranio. 1997;15:21–37. Perez Cdos R, Gonzalez MR, Prado NA, de Miranda MS, Macêdo Mde A, Fernandes BM. Restoration of noncarious cervical lesions: when, why, and how. Int J Dent. 2012;2012:1–8. Peumans M, De Munck J, Van Landuyt KL, et al. Restoring cervical lesions with flexible composites. Dent Mater. 2007;23:749–754. Heymann HO, Sturdevant JR, Bayne S, Wilder AD, Sluder TB, Brunson WD. Examining tooth flexure effects on cervical restorations: a two-year clinical study. J Am Dent Assoc. 1991;122:41–47. Allen EP, Winter RR. Interdisciplinary treatment of cervical lesions. Compend Contin Educ Dent. 2011;32 Spec No 5:16–20. Silva AG, Martins CC, Zina LG, et al. The association between occlusal factors and noncarious cervical lesions: a systematic review. J Dent. 2013;41:9–16. From Decisions in Dentistry. November 2018;4(11):10, 12–14,17. Stephen A. Rappeport, DDS, has practiced periodontics for more than 35 years in Fort Smith, Arkansas. He is an associate professor in the College of Health Science, School of Dental Hygiene at the University of Arkansas, Fort Smith. His research interests include occlusion and the relationship between periodontal and systemic health. He can be reached at steve.rappeport@uafs.edu. Thomas A. Coleman, DDS, practiced clinical dentistry for nearly 40 years in Vermont, and has published papers on cervical dentin hypersensitivity (CDH), noncarious cervical lesions, the abfractive process, and occlusal diagnosis and therapy. In the late 1970s, he developed a technique known as the air indexing method to detect and quantify CDH. Coleman continues to work with colleagues, including John O. Grippo, DDS, to advance scientific understanding of etiologic factors relating to masticatory system effects on teeth, muscles of mastication, and temporomandibular joint sequelae for occlusal disease.